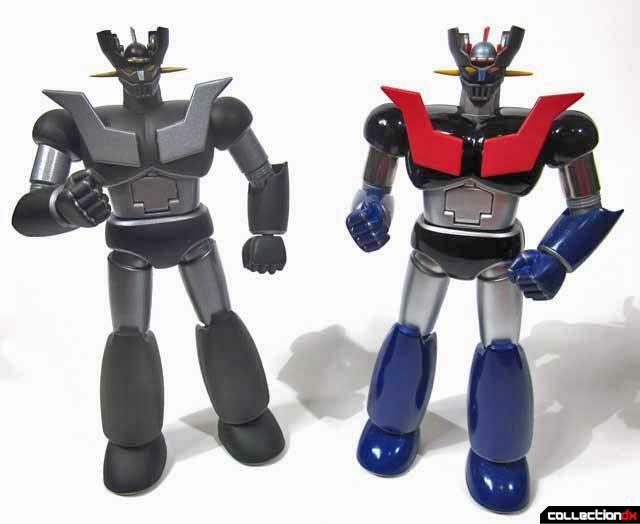 When I decided that I was going to start collecting Soul Of Chogokin I wanted to focus on the Mazinger Z figure releases because as a kid I had always wanted some good Mazinger toys but besides a bootleg I managed to locate, none were available to me as a kid. Being a slave to catalog numbers I decided to just start from the top of the list and work my way down the GX list. 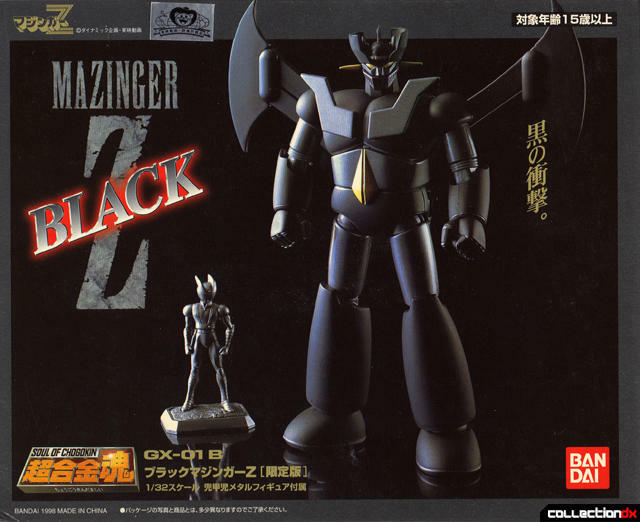 Having picked up the GX-01 Mazinger Z the next on the list was GX-01B Mazinger Z Black. 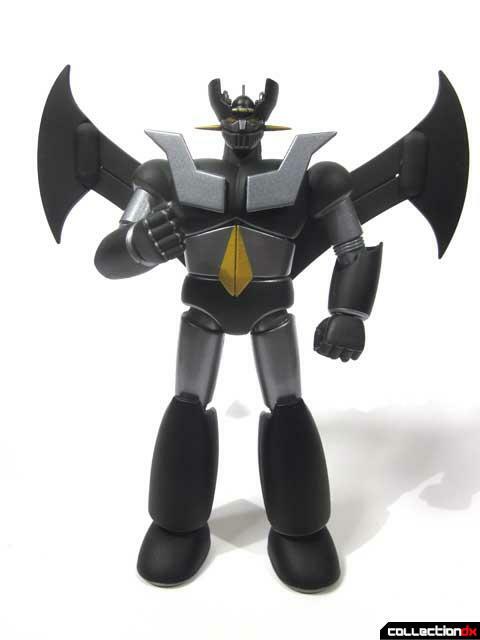 Although not the second SOC release it is the second on the sequential SOC list being right after GX-01 Mazinger Z. 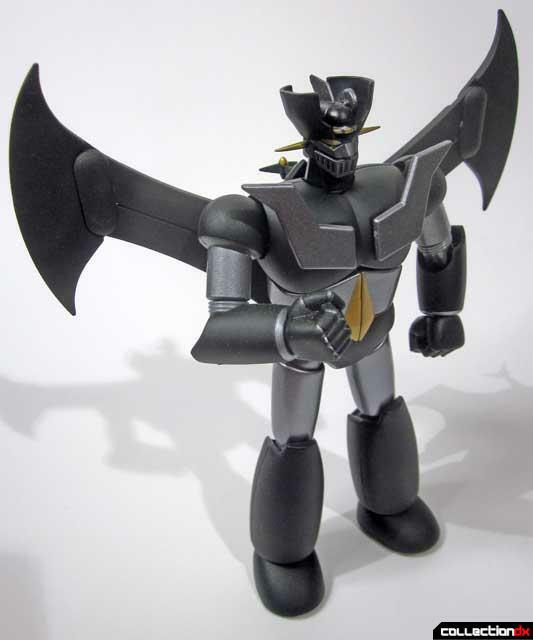 Since the GX-01 was a popular release it was inevitable that Bandai would release a black and chrome versions of Mazinger and a year later in 1998 Bandai would release the GX-01B Mazinger Z Black to collectors. Although at first I was a bit blasé about the release it quickly became one of my favorites. 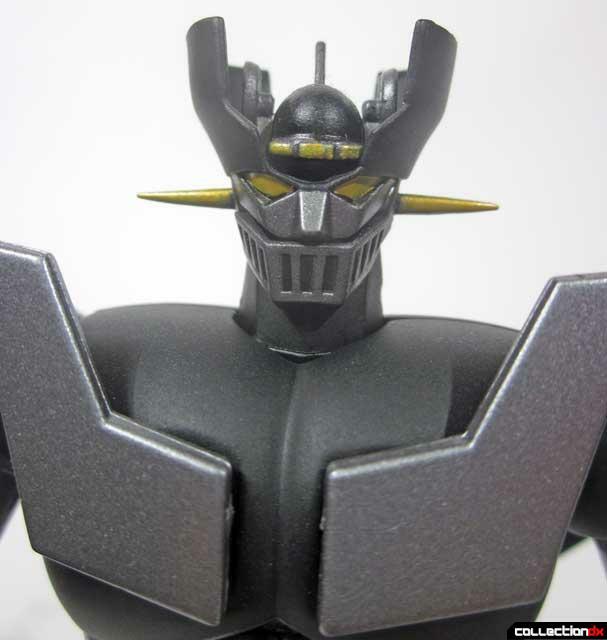 Keep in mind it is just a simple recolor of the GX-01 with all its strengths and weaknesses, please read the detailed GX-01 Mazinger Z review to get a better idea of the engineering of this figure. I bought this figure NOS for around ¥2000 around two years ago and many are still available on the market. 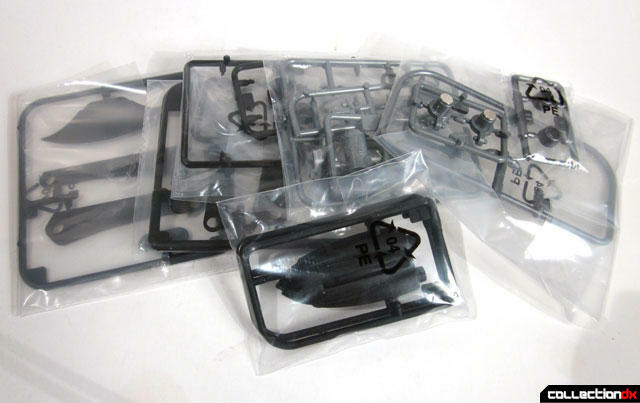 GX-01B comes boxed with the figure itself in a Styrofoam tray with many of the parts needing to be assembled such as the forward arms and Jet Scrander backpack. 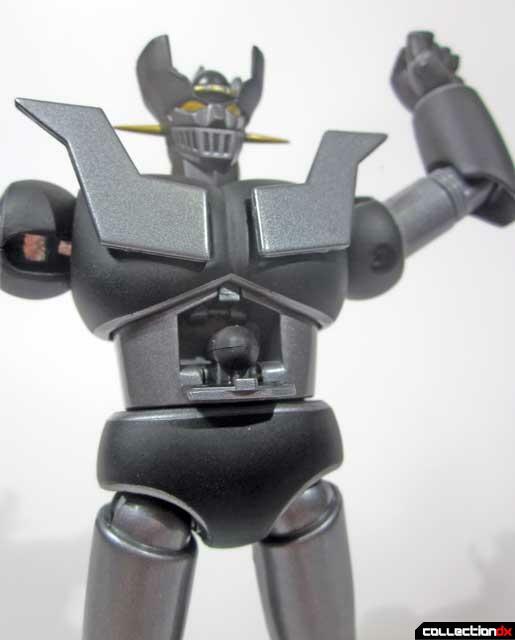 The finish on the figure itself is not a glossy black but a matte black that looks like black primer used on “rat” hot rods. 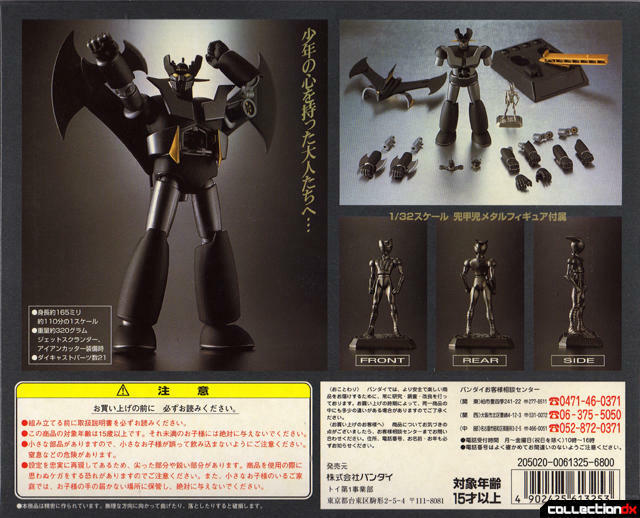 The trim red color on the original GX-01 release was replaced with very subtle but attractive dark yellow and gray colors on GX-01B. Chrome is replaced by matte silver. 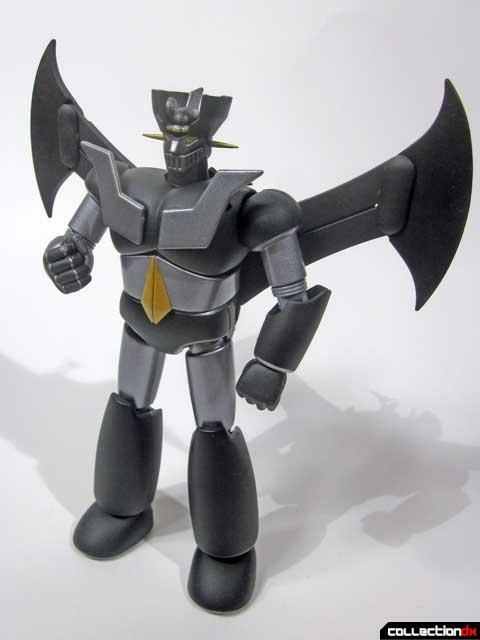 Due to the monochromic nature of this figure I had to adjust the pictures in Photoshop so you can get a better idea of the details, as the figure is much more of a deeper black color in person. When I pulled GX-01B out of the box I was mildly impressed, glad I bought it but not a stand out toy. 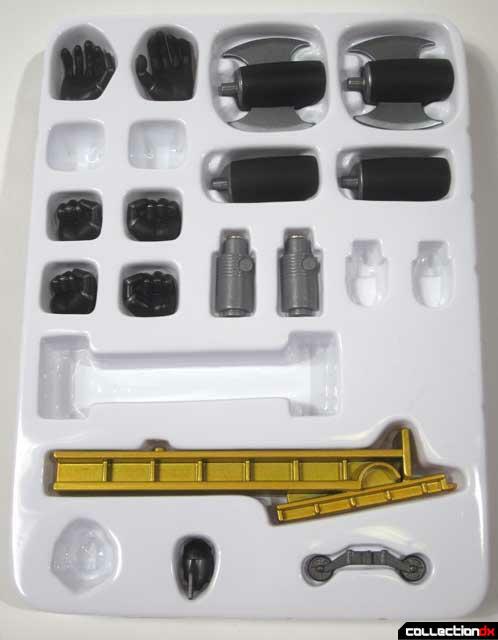 I normally would have left the parts unassembled but because of this review I decided to put the Jet Scrander jet pack together so I can photograph it paired with the figure. 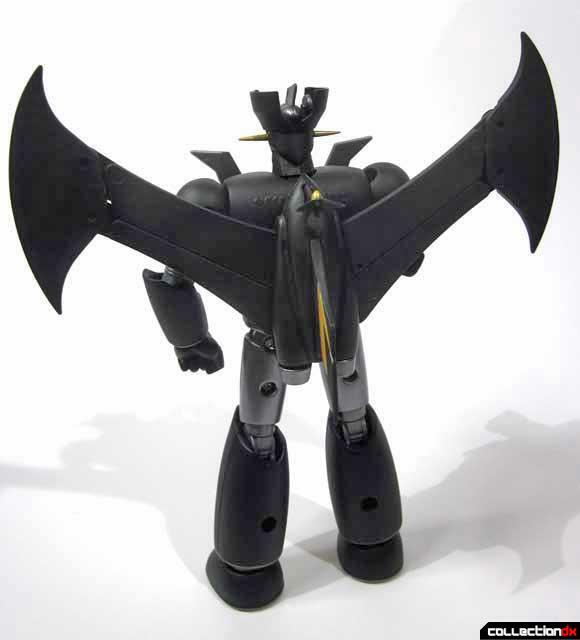 And that is when it popped for me as putting those wings on the figure sort of skewed it to look like some evil looking bat demon creature robot akin to Devil Man. 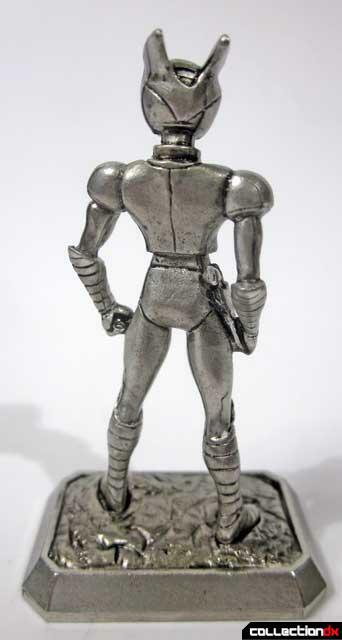 A figure that looked OK when I first pulled it out of the box ended up being very aesthetically good looking figure. 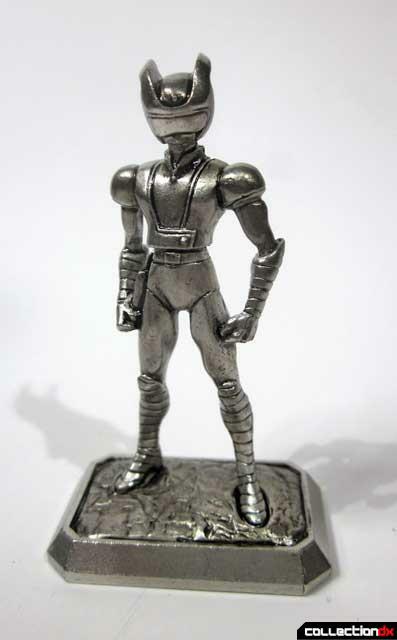 One of the nice little extras that were released with many of the Black version SOC specials was the pewter figure of the pilots of the robots. 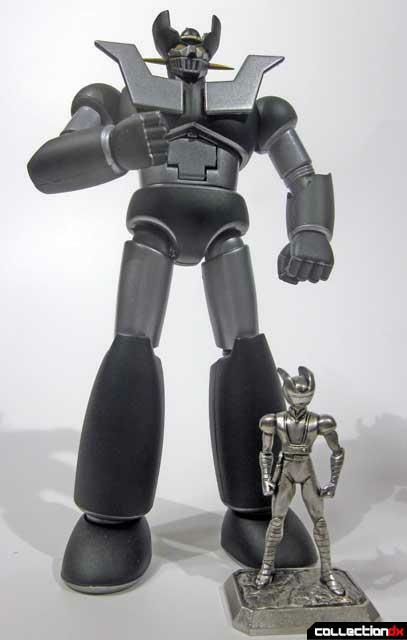 GX-01B was released with a detailed pewter Mazinger Z pilot Koji Kabuto and is a great addition to the set. Overall I am glad I had picked it up, it looks great on the shelf with my other SOC and it is the figure I most often pull out of the case to get a good look at. There are many GX-01B still on the market at reasonable prices and it is definitely worth picking up for the quick vintage SOC fix.